SAN MARCOS – Maybe it was the tournament opening prayer that Gary Smith delivered or maybe it was just sharp golfing skills, but a four-person team sponsored by Christ the Redeemer Church took first place in the 11th annual Lyndon Baines Johnson Museum of San Marcos Golf Tournament Saturday, June 8 at Quail Creek Country Club. Playing on the winning team were the Rev. Gary Smith, Luke Wester, Jerry Perez and Mark Ray. The team’s handicap-adjusted net score was 52.2. Individual awards went to the McCoy College of Business Administration’s Rob Konopaske for closest to the hole and to silver sponsor Lupe Carbajal and Associates’ team member Chavelo Galvan for the longest drive. Members of the last place team – the Austin law firm of Linebarger Goggan Blair and Sampson, which posted a score of 60.4 – were given certificates for free golf lessons by Quail Creek’s teaching pro. Eleven teams participated in the annual museum fundraiser which was initiated 11 years ago by long-time museum board member Ed Cable who passed away in November of 2009. Silver sponsors received special recognition at the luncheon from museum board president Ed Mihalkanin. Silver sponsors included Ted Breihan Electric, Lupe Carbajal and Associates, Dr. B.E. Hughes of Lockhart and the children of the late Ed Cable, who did not field a team. Hole sponsors were Frost Bank, the Texas State University Political Science Department, Café on the Square, Ed Mihalkanin and Mocha’s and Java’s, which provided coffee for the event. Rounding out the list of golf teams competing were those sponsored by Butler Manufacturing Company, the City of San Marcos’ Community Service Division, John Navarrette and the Texas Music Theater. Scott Gregson, treasurer of the board of directors of the LBJ Museum of San Marcos, served as tournament director. The luncheon menu featured smoked sausage prepared by San Marcos’ Precinct 1 Constable David Peterson and all the trimmings. Museum board members applauded the support they had received from the staff at Quail Creek Country Club, particularly operations manager Eric Lee. FIRST PLACE GOLF TEAM – Christ the Redeemer Church of San Marcos fielded the winning team at the LBJ Museum’s annual golf tournament held at Quail Creek Country Club Saturday, June 8. The church’s pastor, the Rev. 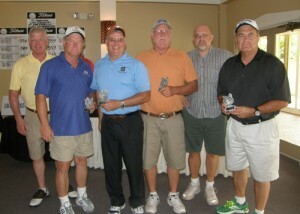 Gary Smith, center, and his team posted a tournament low score of 52.2. Smith’s teammates included Mark Ray, Jerry Perez and Luke Wester (not pictured). 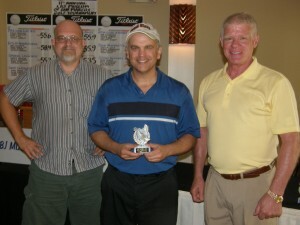 Awards were presented by Scott Gregson, (left) tournament director and the museum’s treasurer. Presiding over the awards ceremony was Ed Mihalkanin (right), president of the of museum’s board of directors. 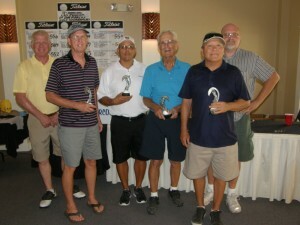 SECOND PLACE GOLF TEAM – Dr. Bill Hughes of Lockhart (center right) and his team, which included Bob Aguilar, Ralph Salazar and Bob Wallis, took second place at the LBJ Museum of San Marcos’ golf tournament June 8 with a score of 53.5. Awards were presented by Scott Gregson, (left) tournament director and the museum’s treasurer. Presiding over the awards ceremony was Ed Mihalkanin 9right), president of the museum’s board of directors. Dr. Hughes has been a silver sponsor for the museum fundraiser for many years. THIRD PLACE GOLF TEAM – Ozona Bank’s team, headed by bank president Steve Searle (right), posted a score of 53.9 to take third place in the LBJ Museum of San Marcos’ golf tournament June 8 at Quail Creek Country Club. 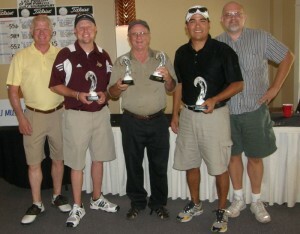 Awards were presented by Scott Gregson, (left) tournament director and the museum’s treasurer. Presiding over the awards ceremony was Ed Mihalkanin, president of the museum’s board of directors (second from right). Rounding out the Ozona team were Doug Bierstedt, Tim Snodgrass and Mike Vordick. CLOSEST TO THE HOLE – The McCoy College of Business Administration’s Rob Konopaske (center) accepted the trophy for closest to the hole from LBJ Museum of San Marcos tournament director Scott Gregson (right) and museum board president Ed Mihalkanin (left). 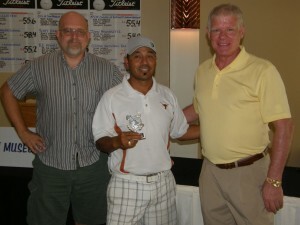 LONGEST DRIVE – Lupe Carbajal and Associates’ team member Chavelo Galvan won a trophy for the longest drive in the LBJ Museum of San Marcos’s 11th annual golf tournament. 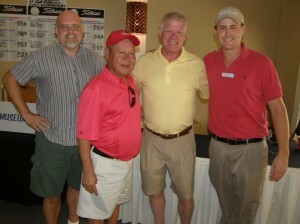 Pictured with Galvan are tournament director Scott Gregson, right, and LBJ Museum board president Ed Mihalkanin, left. A FREE GOLF LESSON – Quail Creek Country Club Operations Director Eric Lee (right) gave a certificate for one free golf lesson taught by the club’s teaching pro to the last place-finishing golf team fielded by the Austin law firm of Linebarger Goggan Blair and Sampson, which posted a score of 60.4. Accepting the certificates on behalf of his teammates was Lupe Carbajal (center left). Joining in the ribbing of the high scoring group were LBJ Museum of San Marcos Board President Ed Mihalkanin (left) and Tournament Director Scott Gregson (center right).